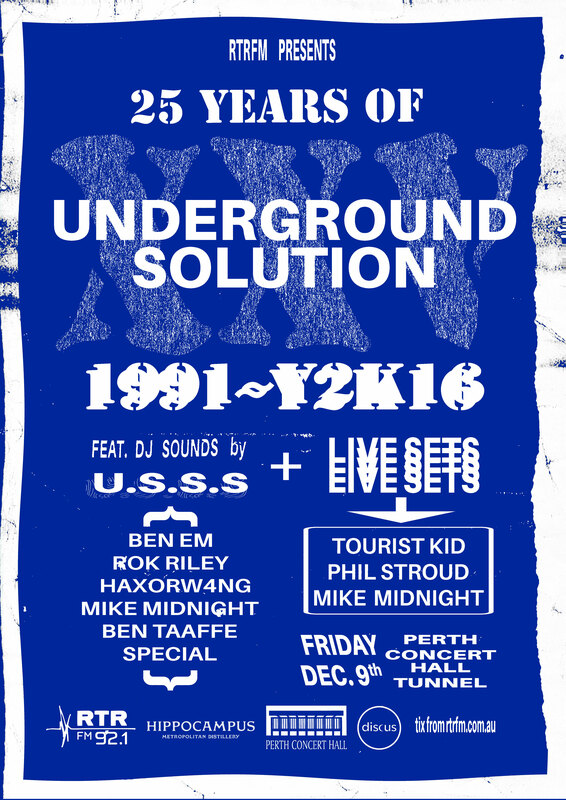 Celebrate a quarter-century of RTRFM’s groundbreaking Underground Solution program at the Perth Concert Hall Tunnel on Friday December 9. Since its inception, Underground Solution has been at the forefront of electronic music, unearthing innovative and scene-changing sounds from Perth and beyond. From the early days under the Strictly Rhythm banner, its formative years with Ben Stinga, the ambitious live broadcast from The Greenwich in the 90s when internet radio was unheard of, to the modern collective of master selectors, the Underground Solution crew remain devoted to mining the frontiers of forward-thinking dance music, from wiley veterans to bedroom producers to the fringes of new movements in electronica. The UNDERGROUND SOLUTION SOUND SYSTEM — featuring Ben Em, Rok Riley, HAXORW4NG, Mike Midnight, Ben Taaffe and Special — promise a night of exploratory, deep and synaesthetic sounds. PHIL STROUD weaves percussion and ambience with the finesse of a master craftsman and the poise of a conductor. On his Good Company Records release The Forest / Yemaja, and his soon-to-be-released eponymous debut LP, Stroud illuminates new territories of rhythmic possibility, melding hypnotic percussive patterns with organic, mystic flurries into a mix that’s thought-provoking, meditative and eminently danceable. TOURIST KID conjures sonic remedies to quell the tinnitus in his head. On his debut EP A Circulation, out through Melbourne label This Thing, his compositions traverse the intersections of glitch, rhythm, ambience and melody. What emerges is a collection that embraces minimalist composers and contemporary noise artists in equal measure, resulting in an aesthetic that feels like the sounds of sacred geometry. MIKE MIDNIGHT is one of Perth’s most forward-thinking DJs. In the last 12 months, he’s cemented himself as a fixture of clubs and warehouse parties around Perth, played shows in Eastern Europe and supported Detroit producer Omar-S and contribute a mix to Rinse FM. No one is more prepared to guide you deep into the mix. 25 Years of Underground Solution – feel the deepness.